With TRUE Colloidal Silver Cashmere Hands Cream, you will get immediate results for dry, cracked hands and feet! TRUE colloidal silver means predominantly silver particles, NOT silver ions. 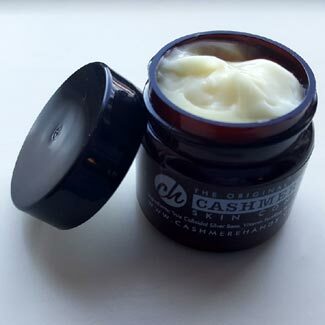 Cashmere Hands Skin Conditioner is like nothing you have ever experienced. Colloidal Silver is a natural anti-inflammatory that works fast to reduce swelling and repair inflammation in the skin. True Colloidal Silver Cashmere Hands Skin Conditioner also helps with dry chapped hands, rough cracked heels, sunburn and chronic dryness. Colloidal silver is also used for skin conditions including rosacea, cradle cap (atopic dermatitis), eczema, impetigo, and psoriasis. Colloidal silver can also be applied directly to the skin for acne, burns, eye infections, fungal infections, skin infections, and Staphylococcus infections. Colloidal silvers have been around for hundreds if not thousands of years and have been used by many ancient civilizations as a means to maintain health. Before the mainstream discovery and acceptance of antibiotics in the early 1900’s, silver products were used by doctors. These earlier versions of silver products are not to be discounted because they indeed provided countless favorable benefits to those who used them to improve their health. How does Colloidal Silver work? Colloidal silver can kill certain germs by binding to and destroying proteins – read information about True Colloidal Silver. Not every silver product is the same. After countless years of research Cashmere Hands has created the finest hand and foot conditioning cream in the world in a base of TRUE colloidal silver. As a result of this extensive research, they have learned a lot about silver and how it functions. Through months of development, Cashmere Hands created a miracle product so that a user can experience results immediately! True Colloidal Silver Cashmere Hands Cream does not contain oil, alcohol or greasy additives. It DOES contain a True Colloidal Silver base that your body needs and most likely lacks. This gentle skin conditioner contains all the goodness of natural ingredients and is rich with the gentle antibacterial action of Colloidal Silver. Cashmere Hands Cream coats your hands and dries in less than a minute. After that you don’t even know you have it on, except that your hands are smoother than they have ever been. You won’t find anything like Cashmere Hands Skin Conditioner at the store. Cashmere Hands is made from True Colloidal Silver, a century old anti-bacterial healer that truly works. Cashmere Hands does not contain petroleum by-products, alcohol or wax. No matter what condition your skin is in, Cashmere Hands will instantly make it feel smoother and stay smooth for hours. Cashmere Hands dries remarkably fast, leaving no greasy residue on clothes or your steering wheel if you drive. Get your 1 oz FREE True Colloidal Silver Cashmere Hands Cream and try it for yourself! Do you have a skin condition? Don’t treat the symptoms – heal the source of the condition. You could spend twice the cost, but you will not find a more effective, satisfying treatment for you skin than True Colloidal Silver Cashmere Hands!